Of the hotels which run along Park Lane, The Dorchester is one of the best known. Originally the site of Dorchester House, a mansion built in 1853 which was demolished to allow The Dorchester Hotel to be built from scratch, it opened in 1931 and has always been one of the most prestigious hotels in the UK and indeed in the world. 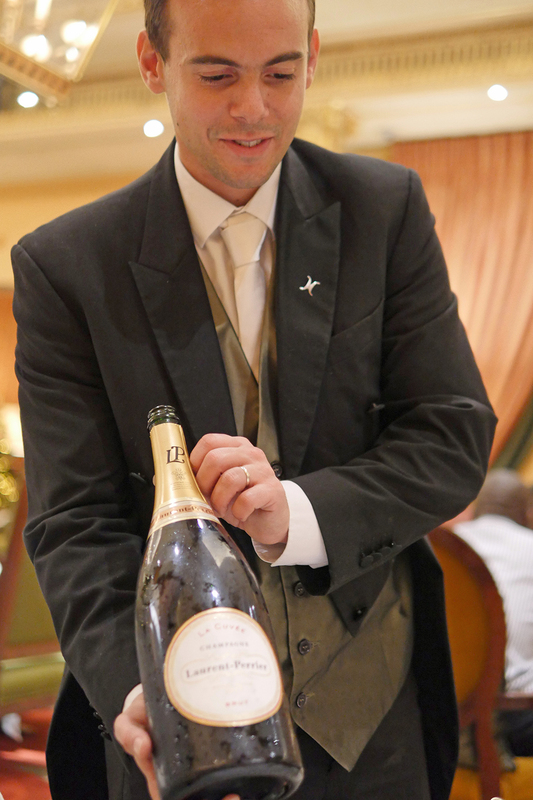 I’ve been before of course, for drinks in the evening, for events in the ballroom and even for dinner at the 3 Michelin Starred restaurant, Alain Ducasse at The Dorchester. But, curiously, I’ve never been for tea, let alone for a festive afternoon tea. What better time to go than in the lead-up to Christmas when the hotel is wonderfully decorated and The Promenade where tea is served has all the feeling of a grand Victorian house. The Dorchester still retains many of its original fixtures and fittings, despite being extensively modernised between 1988 and 1990. 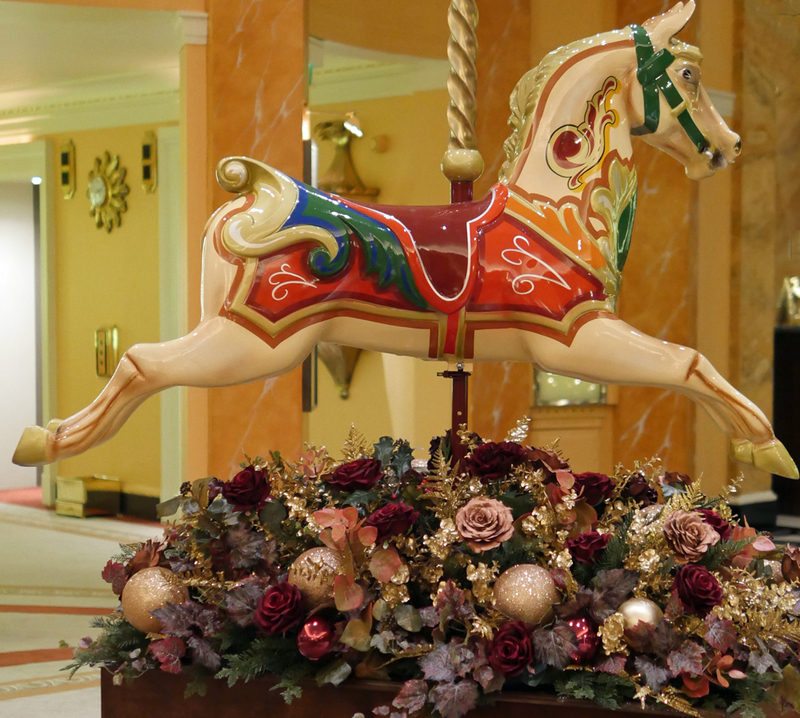 And, this year’s Christmas decorations include Victorian fairground horses and a whole avenue of Christmas trees, together with some pretty foliage and glittering lights. My companion opted for the more appropriate Dorchester Afternoon Blend, a black tea designed to pair with afternoon tea. The Festive Champagne afternoon tea now being served comprises traditional sandwiches on artisan bread, scones, festive pastries and mince pies along with a wide selection of teas and of course, a glass of champagne. There’s a personal touch too, your own waiter wearing a waistcoat and tails, brings you everything and caters for any dietary whims. I generally don’t eat egg for example, so our truffled egg sandwiches on white bread came on a small separate plate. 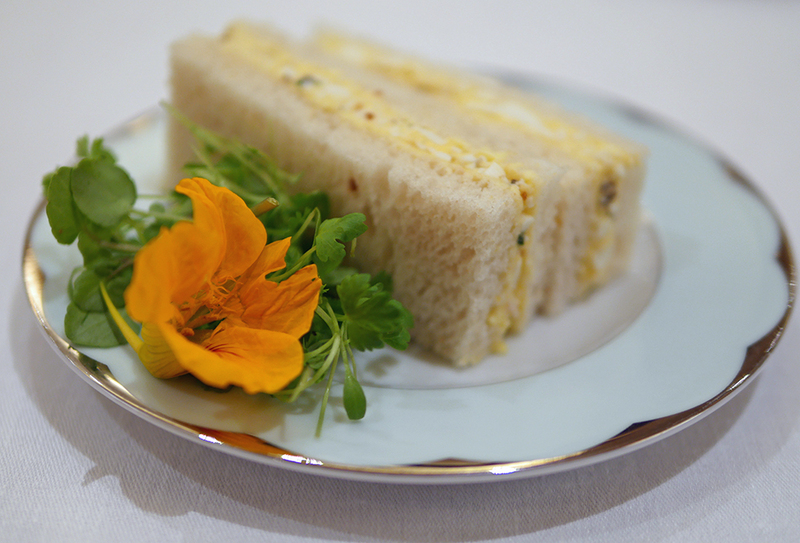 As it happens, there was no way I was going to miss ANY of the pretty finger sandwiches – and, with a rich lacing of truffle mayonnaise, I loved my mouthful of egg. The remaining sandwiches comprised a modern twist on a classic cucumber sandwich, baby cucumber and pear with minted cream cheese on walnut bread, Honey-roasted maple ham with orange marmalade and chardonnay mustard on multigrain bread, a very seasonal and delicious traditional Norfolk Bronze turkey with stuffing and mustard on cranberry bread and my personal favourite, a traditional smoked salmon with Cornish crab, herb mayonnaise and confit lemon on brown bread. 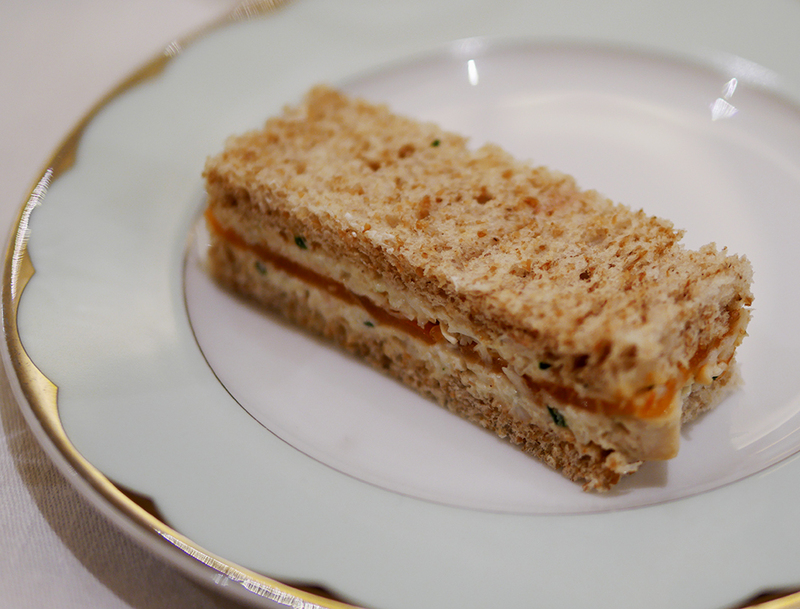 And, what I thought was described as Coronation chicken, but which I think on reflection was a homemade sandwich spread as neither of us found any chicken in it. Something of an outlier, it’s not listed on the menu and I suspect was meant to be a thoughtful addition to replace the egg I wasn’t meant to eat! There really wasn’t anything to fault, the bread was perfectly fresh and every filling was a new, interesting flavour combination. While we were happily nibbling our way through the sandwiches, a flask of rose and peach scented floral tea arrived to act as a palate cleanser between the savoury and sweet dishes. 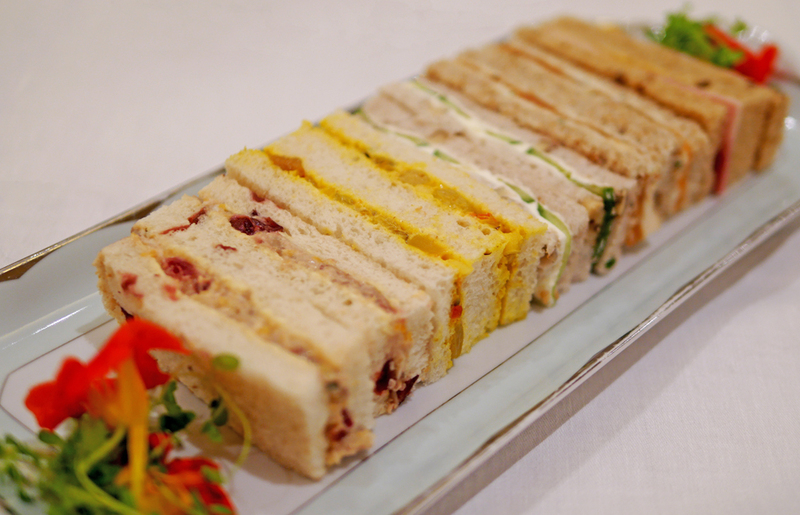 We passed on the offer of extra sandwiches safe in the knowledge that we’d probably fail to finish the pastries if we indulged so early on in the afternoon tea. 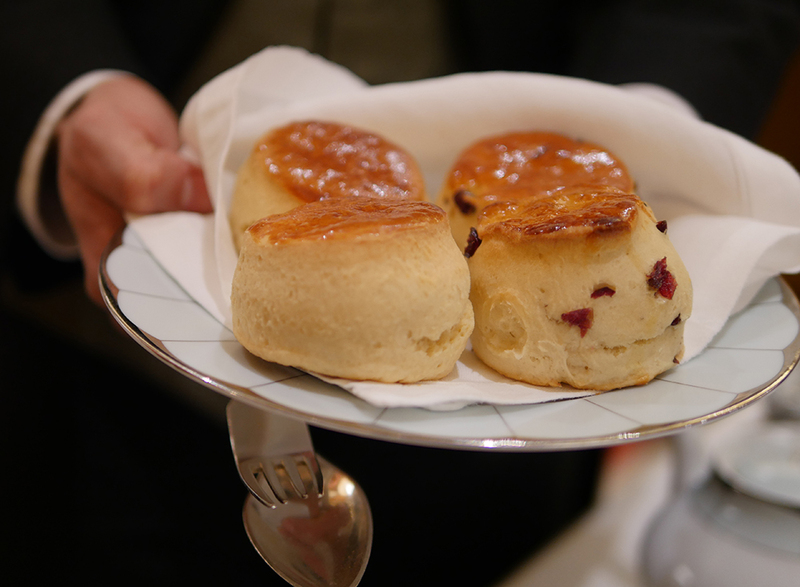 Fresh tea and scones – warm from the oven and a mixture of plain and seasonal cranberry, arrived. Homemade strawberry jam, peach and apricot and Cornish clotted cream completed this stage. I loved the strawberry jam with tiny whole strawberries and despite offers of different flavours, I think we both ate nothing but the classic. 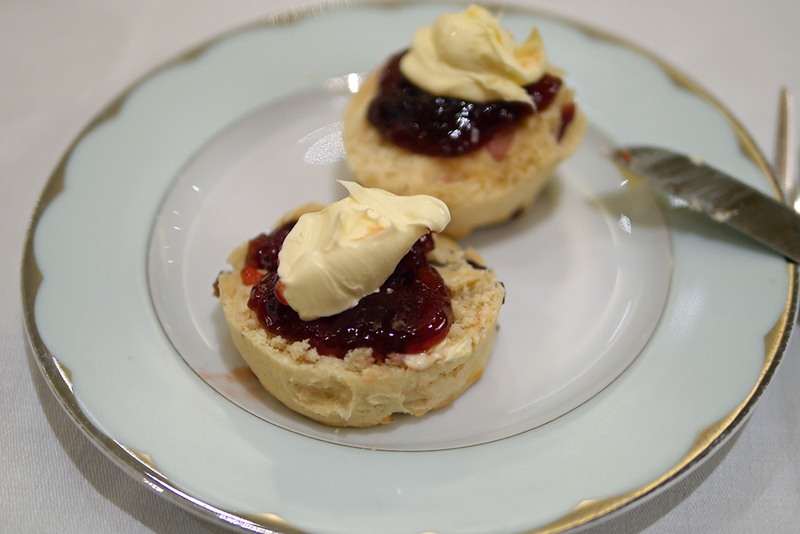 Again, faultless – beautifully light and fluffy with a delicate glaze and with generous helpings of both jam and cream. 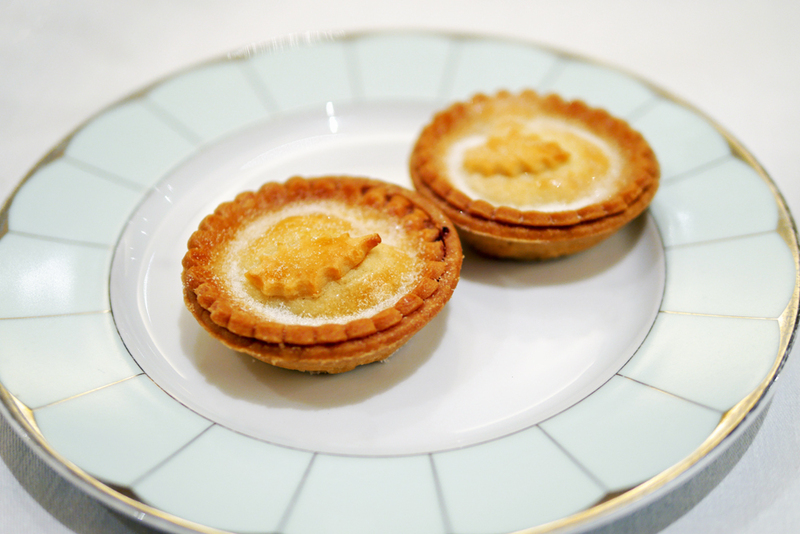 Of course, any afternoon tea is only as good as its pastries. 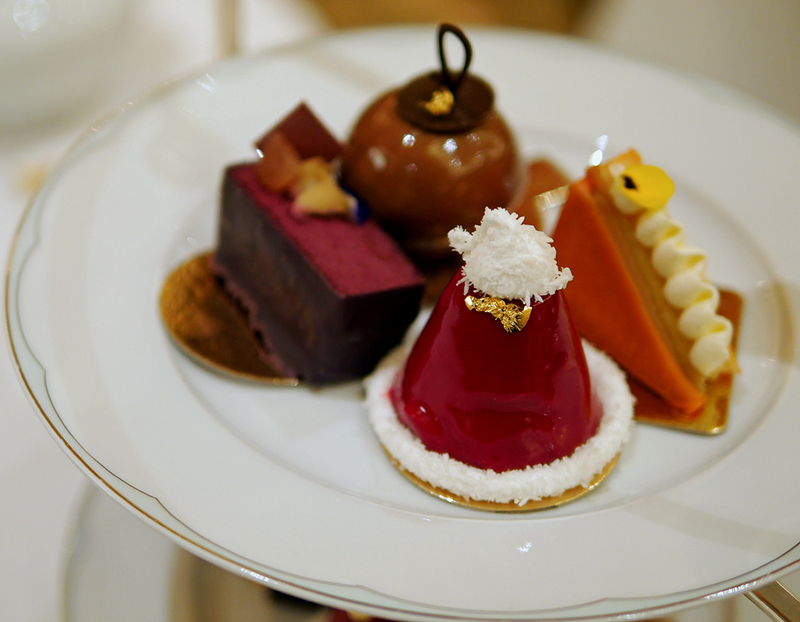 There’s always a wow factor for a seasonal tea – here a plate of four each. Santa’s hat was a striking and convincing model, with a ginger panne cotta and mulled wine jelly filling and with piped marshmallow trimming and bobble. 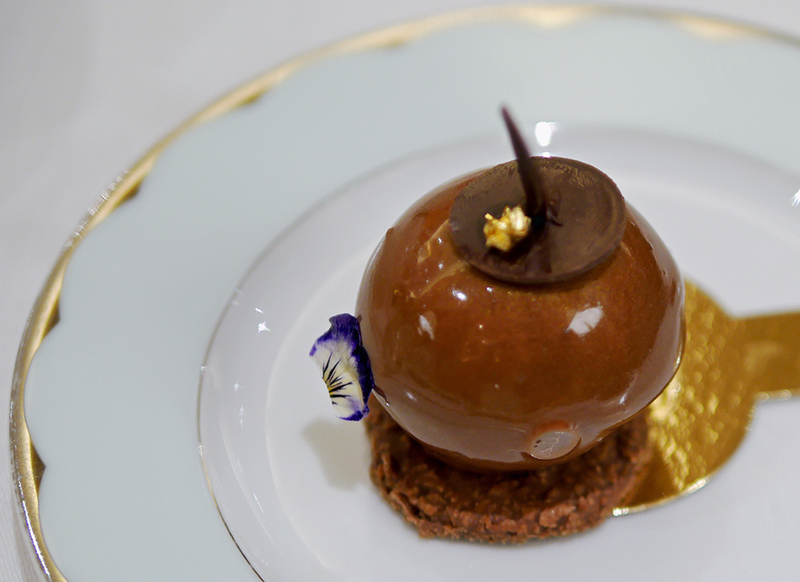 The pretty chocolate Christmas bauble was filled with a delicious light cinnamon spiced apple compote, streusel crumble and vanilla custard. 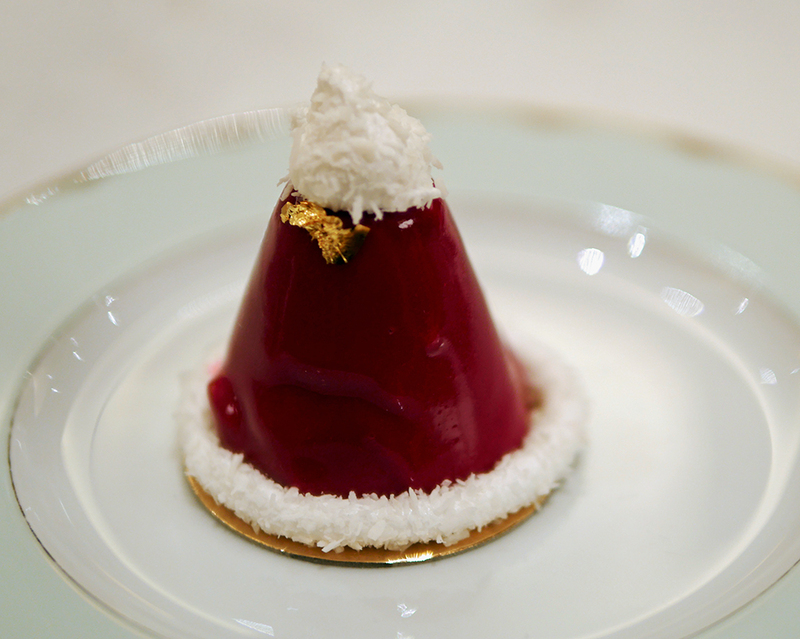 Chestnut Cassis, Mont Blanc, a rich blackcurrant and lemon mousse on a chestnut biscuit garnished with edible gold leaf, was both festive and seasonal, with a luxurious and rich earthiness. 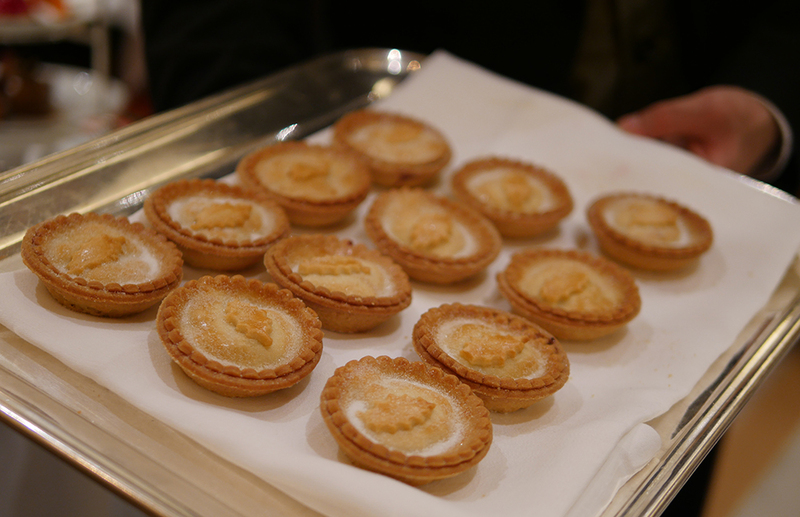 Finally, mince pies (somehow I found room for one). Beautifully crisp shortcrust pastry with that sable brown that comes from lashings of butter and a delicately spiced mincemeat. My first of the season, these were not served warm but didn’t suffer for that thanks to the excellent pastry. This afternoon tea is a special treat. Firstly I’d defy you to find fault in the food or service. 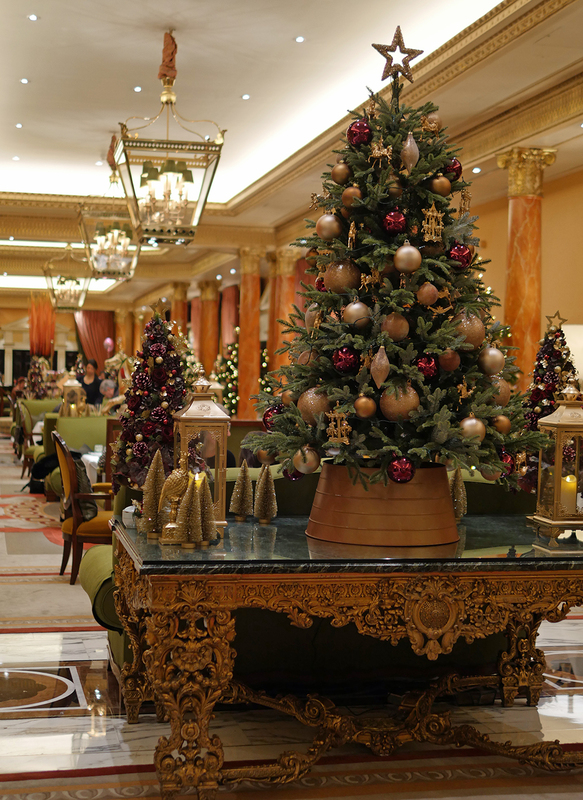 Secondly, the setting is glorious, with the opulent Christmas finery adding to The Dorchester’s own elegance. 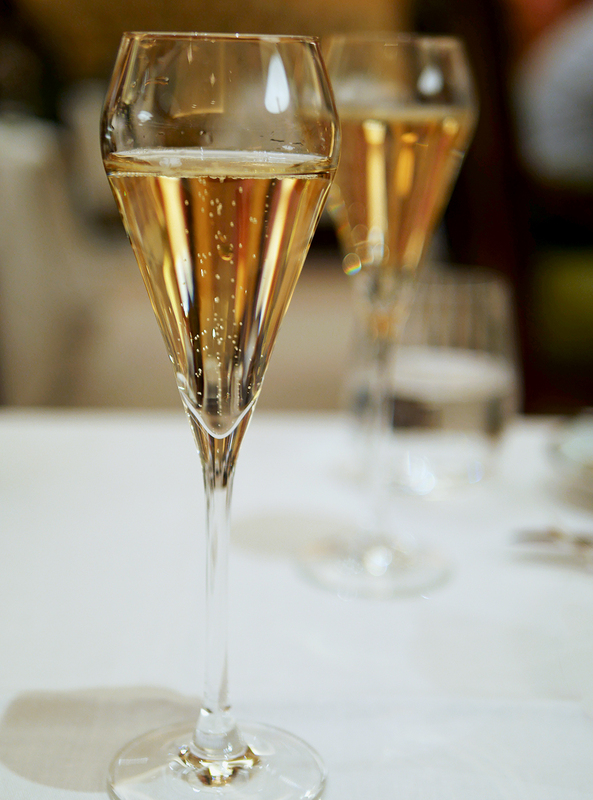 And finally, when else do you have an excuse to drink champagne in the afternoon! 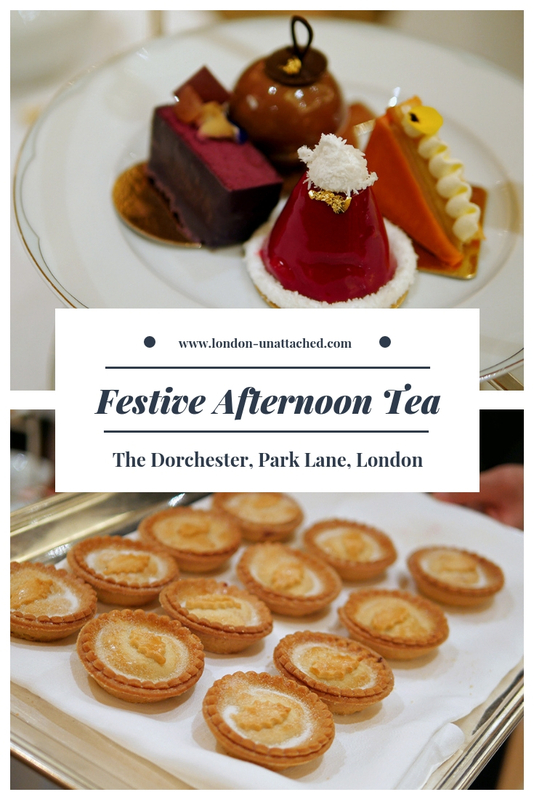 Weekday festive champagne afternoon tea at The Dorchester starts at £85 per person including a glass of Laurent-Perrier La Cuvee. At the weekends throughout the festive period, there’s a £10 premium – from November 17th, there will be carol singing at each tea. 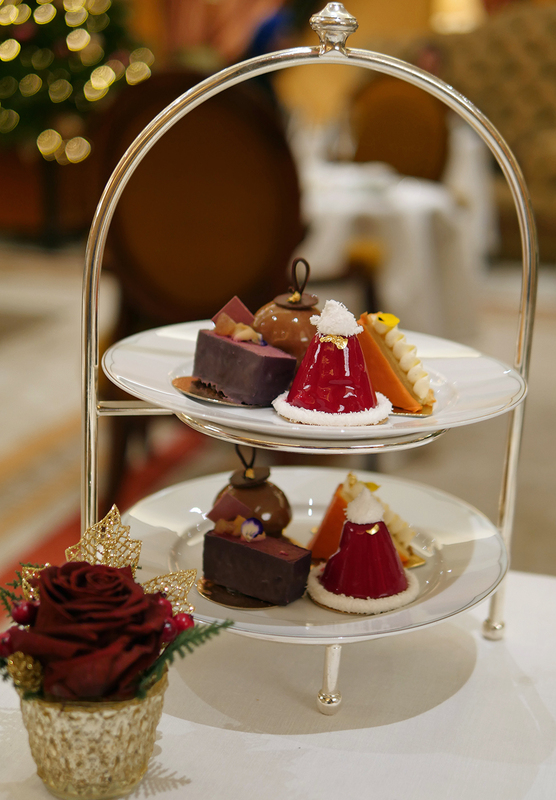 And, there’s a festive champagne afternoon tea service both on Christmas Eve and Christmas Day. For more afternoon tea recommendations, please do check our review of the best places in London for afternoon tea.